A tough but highly-rewarding loop through the gorgeous hill country west of Bragança, just south of the border with Spain. Almost all of the ride is within the Parque Natural de Montesinho, a wild and rural landscape of deep valleys, big hills, chestnut orchards, small farms and isolated villages. It’s not an easy ride – at a rough calculation there’s more than 1,000m of climbing involved on the route detailed below. On the other hand, the views more than compensate for the effort involved. The circuit described below starts from the entrance to the Cepo Verde campsite near the village of Gondesende and includes a detour to the small town of Vinhais. The only real sights here are the huge convent of São Francisco at the western end of town and a few scraps of ruined castle. However, as well as being a pleasant provincial town, it’s also home to one of the best cafe/bakeries in northern Portugal! For anyone wanting to start from Bragança itself there’s a second map below – this option is only fractionally further but leaves out Vinhais (and its cakes). Total distance of 61.6km (38.5 miles). Moderate to tough. No severe inclines but some long climbs and a few steep sections. You’ll find all the facilities you need in Bragança – the campsite at Cepo Verde is in a lovely location and makes a nice base if camping. There are also some rural tourism properties in the area. Vinhais provides a range of cafes and shops, plus a supermarket and some accommodation options. There are few options elsewhere on the ride. There’s a cafe in Zeive (see above) but I don’t remember spotting anything else. From the campsite/Gondesende it’s only a short distance to the N103 that runs between Bragança and Chaves, which dips and twists through a mixture of farmland and forest. Although an N-road, this is not a busy road. I did it on a weekday in September and saw hardly any traffic. It’s also well-surfaced with a decent shoulder. More of concern will be the climbs along the way. From the N103 junction near Gondesende, there’s a lovely downhill run, dropping about 150m in height to a bridge across a small stream. The following climb is fairly gentle and not too long, after which it’s down again to the Rio Tuela. 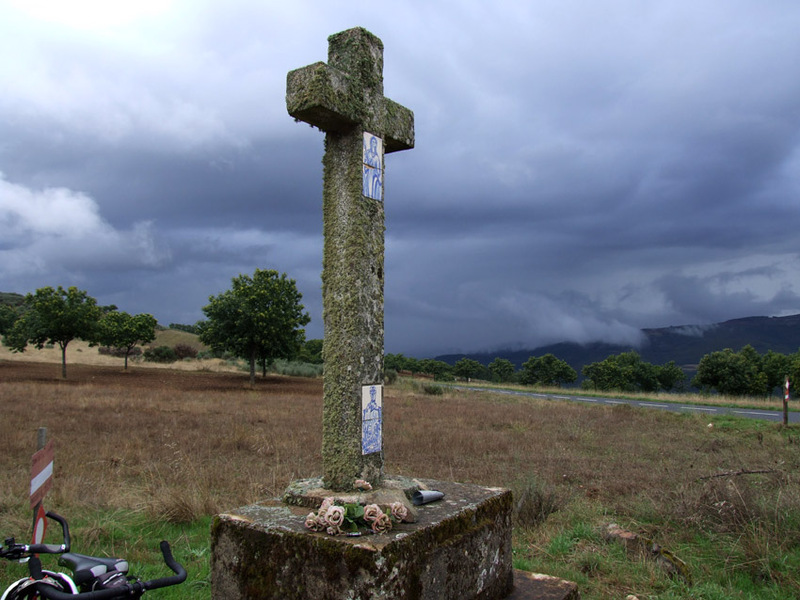 The second climb – of around 190m – takes you up to the village of Vilaverde. 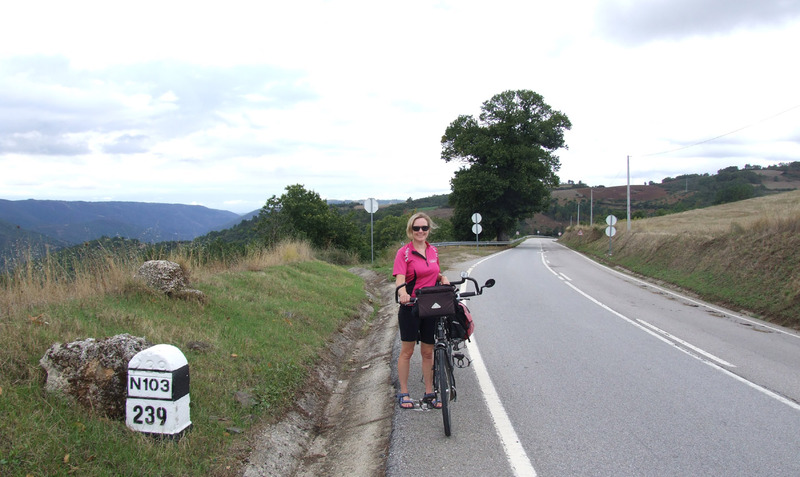 If you wanted to shorten the route (or if you’re following the map from Bragança) turn right here. Alternatively keep going along the N103 to Vinhais. From Vilaverde, there’s another downhill to Vinhais as the road wriggles around the side of the Tuela valley. There are various cafes in the town – as well as other shops – but the one I would recommend is the Santa Clara. As you come into Vinhais there’s a slight uphill with a fountain and park area on your right. The road then turns right – with a small supermarket almost directly ahead down a cobbled side street. The Santa Clara is a bit further up the main road on the left. I can’t vouch for all the cakes but the bolo de arroz were probably the best I’ve ever had in Portugal and the pao de cereais (multi-grain bread) was also extremely good. Vinhais is worth a quick stroll around. You then have to retrace your steps back up to Vila Verde (about 130m of ascent) and turn north. The countryside becomes even more rural now – a semi-wild landscape of woods, sweet chestnut orchards, small fields and views of brooding hills. There’s also some steady climbing to do and around 140m of further ascent before the road levels off. 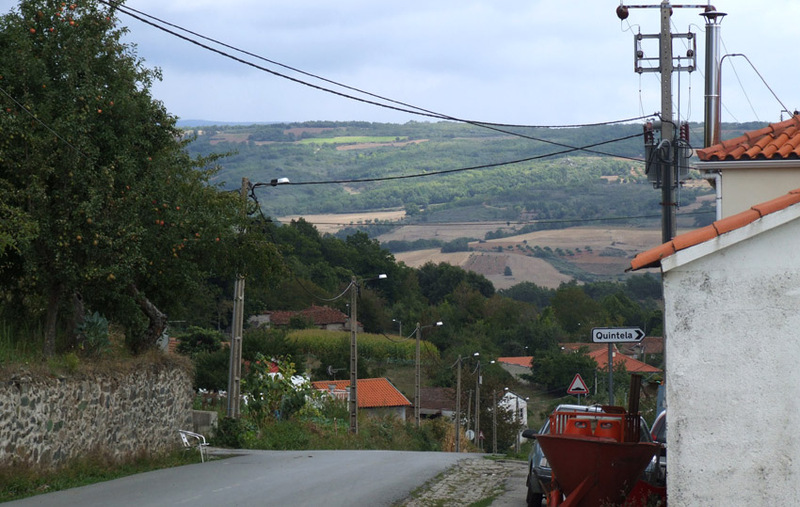 After skirting the hamlet of Prada, the road continues over the hill to a slightly larger village called Paçó before you drop all the way (around 180m) back down into the Tuela valley. This is then followed by the biggest climb of the day – around 290m of ascent as you head towards the village of Mofreita. It’s about 5.6km to Mofreita but most of the climbing is done over the first half of that distance and involves a couple of fairly steep sections. The climb gets easier over the next kilometre or so and the last bit towards Mofreita is more or less on the level. There is the opportunity of a side trip of about 3km just before Mofreita. The village of Dine, signposted off to the left, is described as ‘enchanting’ by the Rough Guide – there’s also a cave here, not discovered until 1984, that contained Neolithic remains dating back to 4000BC. I didn’t make this detour as it was raining when I got to the top of the hill and to get to Dine you have to descend about 100m and then climb back up. However, if anyone can recommend the trip, please let me know. When you get to Mofreita you can turn off if you want to go into the village itself but be warned that the road through the centre is cobbled and extremely rough. Apart from some traditional houses there’s also not a lot to see. From here the road is a lot flatter for a while, curving its way through a very pretty rural landscape. There is a small cafe in the next village, Zeive, if you need a break (or as we did to get out of the rain). The last part of the ride is gentle for a while then there’s one more climb up to Oleiros. From here, turn left for a welcome downhill to Gondesende and the end of the ride. The map below shows the route from Bragança (for some reason the image on this page won’t show the correct route but if you click on the link for ‘view larger map’ it works fine).